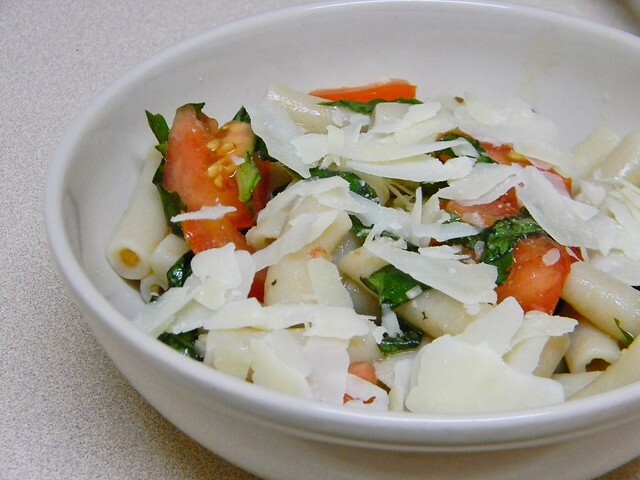 One other recipe that caught my eye when I was reading Jacques Pépin’s The Apprentice, was for pasta primavera. (The first one was for eggs Jeannette.) One thing I love so much about M. Pépin’s recipes are their utter simplicity and ease; often this includes ingredients already in your kitchen. This pasta was an instant hit with my family and it is on our repeat list. Everyone wanted seconds! The tomatoes and basil, with olive oil, garlic, salt and pepper, marinate for a time while the noodles cook. It flavours the pasta, giving a pleasant and satisfying taste. Pasta primavera, according to M. Pépin, was invented by his artist friend Edward “Ed” Giobbi. He served it to Sirio Maccioni, the owner of a restaurant called Le Sirque, after he was asked if he knew of a pasta recipe that was different. There are two more people who lay claim to the creation of this pasta dish, one of whom was the chef of Le Sirque, who used cream instead of olive oil and vegetables instead of tomatoes; the other is Sirio Maccioni’s wife. Now there are many versions of pasta primavera online and in cookbooks, but this is the one that I think I like best. It’s simple, uncomplicated, and easy to make. If I were to ever gussy it up a bit, it would only be with vegetables; a cream version sounds too heavy for me, even if I used coconut milk instead. If you’re not in the mood for pasta, Jacques Pépin also says that the tomato salad component on its own is wonderful on toast. We doubled this recipe and people still wanted more! Make more as needed. If you’re avoiding dairy, you may omit using the cheese when serving or use a dairy-free cheese, although the pasta is also great without. While there are measurements for the ingredients, play with the amounts as you like. Sometimes I’ve upped the amount of garlic (using 2 cloves), for example. Slice the tomatoes cross-wise and cut into 1/2-inch pieces. (Optionally, you may take the seeds out as in the M. Pépin’s instructions but I left them in.) Put the tomato pieces into a bowl large enough for the finished dish and gently stir in the rest of the ingredients except for the pasta and cheese. Bring water to a boil and add pasta, cooking according to package instructions. (You may salt the water, if you wish, while remembering to keep in mind that the tomatoes already have salt. This isn’t a salty dish.) Add 6 ounces of hot pasta water to the tomatoes. Drain noodles and add immediately to the tomatoes, stirring gently. Portion servings and sprinkle with cheese, if wanted. *Shredding basil leaves: roll up the basil leaves lengthwise and slice thinly in one direction, crosswise. Sounds delicious. I don’t include pasta in my diet at the moment because I don’t know of any that are SCD legal – any advice? Hi Danielle, the best option I can give you and that I’m aware of for SCD is veggie pasta, such as zucchini noodles (made with cooked zucchini cut into ribbons – there are specially designed machines for this or you can do it yourself). You could also try spaghetti squash. When it’s cooked, running a fork along the flesh creates strands similar to spaghetti. I hope that helps!